Samsung has officially unveiled world’s largest screen smartphone Galaxy Note 2 with all new features. The Samsung Galaxy Note 2 was launched in the largest electronics show held in Berlin, Europe. This is the first smartphone launched by Samsung after the legal battle with Apple in the past. According to the Samsung, through Galaxy Note 2 they will get the top position in battle against Apple. It has being said that, recently Apple defeat Samsung in the patent legal battle and judicial ruling to pay a billion dollars. Due to the battle, the android market is affecting a lot. After the war, Samsung’s many products were ban in the market. Now, Samsung official are expecting good response from the new Galaxy Note 2. The uniqueness of Galaxy Note 2 is its large screen of 5.5 inch Flexible (Unbreakable) screen. Interestingly, Samsung Galaxy Note 2 has been launched with the latest Google android Jellybean. The Galaxy Note 2 smartphone also have the multi language support system with all Indian languages and other. The Samsung Galaxy Note 2 has 5.5 inch screen with 1280-800 pixel resolution and 9.6 mm thin with the 180 grams of weight. And the most important feature of Galaxy Note 2 is that, it has 8 MP rear and 2 MP front camera with an average battery capacity of 2500 MHz and will run on 2 GB RAM speed as 1.6 GHz processor. It is expected that, the Samsung Galaxy Note 2 price will be Rs 40,000. 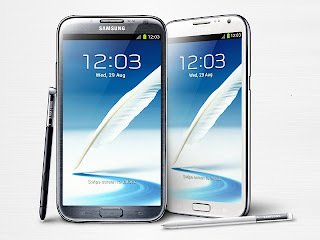 The Galaxy Note 2 will reach in October, 2012 in India.